Having recently finished The Gift of Time, a gift written by 15 authors for Jerry Weinberg‘s 75th birthday in 2009, and a present from Michael Bolton when I met him for the first time in 2010, I am inspired by a thought experiment based on two chapters in that book. The other chapter is from Bent Adsersen on “Time – and how to get it”. I have written before on Michael Bolton’s Relative Rule here. Bent adds a new perspective on the time factor to it. So, I will start with that. Bent describes two things in his chapter. First, the different perspectives on time that the old Greeks had, namely Chaos, Chronos (order and structure), and Kairos (the space in which things happen). With these concepts Bent describes the concepts of slow and fast time – when things seem to happen in a few moments though really taking hours, and when even minutes take a long while, i.e. when you are waiting for a delayed train at a train station. To sum up Bent’s thoughts time is perceived differently. Well, could you say that the Relative Rule applies here? Maybe, let’s check. So, time seems to be abstract, even besides the definitions that the modern science gave it to them. So, time is time to some person at some time. But this statement is not correct in itself. It’s rather that time spent on doing something is time to some person at some time. This introduces a new variable to the general systems law of Bolton’s Relative Rule. There is a person interacting with the abstract thing at some point. Now, quality is not only value to some person, but quality in doing something is value to some person at some time. Time itself on the other hand is time to some person at some time. We end up with quality in doing something is value to some person at this person’s perceived time. Putting this in a relationship to each other, we can visualize it using a diagram of effects. Here is the version I ended up with. As you can see, the term quality is caught in a double feedback loop. On one hand there is value, that is in Weinberg’s words something of worth, so that the particular person would actually spend money on getting it. The other thing is time, which is an individual perception. 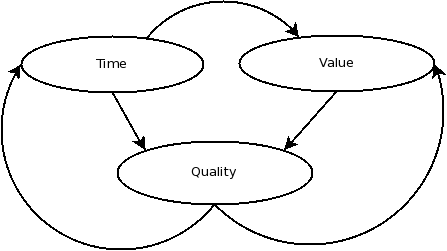 The diagram expresses that the better the perceived time is for that particular person, the better the perceived quality will be for that person. On the other side of the diagram, the more value the person gets from the application, the higher the quality will be for this exact person. But there is more to it. Value and time interact with each other. The value over time is perceived differently by different people. The relative rule seems to apply here as well. If we update the diagram, we find that time now has twice the impact on quality. But what do we do with all of this? First of all, quality is intangible and abstract. When someone makes a statement about quality, I start to explore what he means by that. I try to explore the time dimension. This is also a suggestion that Bent makes in his chapter. Try to substitute time for something else – the thing that you really mean. Do you mean ‘eggs’ by ‘quality’, then substitute ‘we need more eggs in this application’. Do you mean ‘vinegar’, well, ‘we need more vinegar in this application’. This trick works as well with negative statements. ‘This application has no quality’ then eventually becomes ‘this application has no useful function for me’ and ‘quality is dead‘ eventually becomes ‘taking care about customer usability has been abandoned’, maybe. Whenever you hear some statement about quality, therefore try to refine that statement to something tangible. This is also the advice that Jerry gives in Quality Software Management Volume 1 – Systems Thinking.